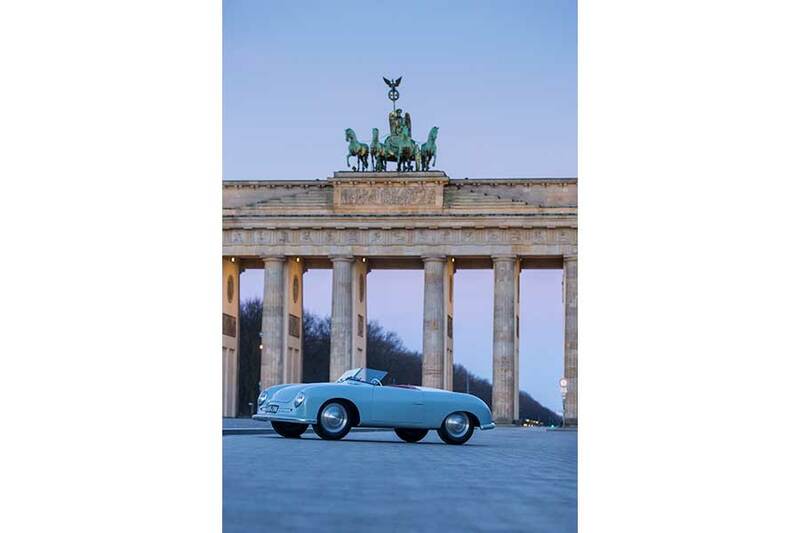 Special exhibition devoted to the anniversary in the capital: On June 8, 1948, the first Porsche prototype with chassis number 356-001 received its general operating permit. It was the birth of the brand Porsche. To mark the occasion, starting on Tuesday, March 20, 2018, the sports car manufacturer will be hosting the first “70 years of the Porsche sports car” special exhibition in Berlin. The exhibition will run until May 31, 2018 at “Drive. Volkswagen Group Forum” (Unter den Linden) and admission is free of charge. This special exhibition is divided into ten topics, each offering captivating insights into the history of the brand and bringing to life various elements of the fascination of Porsche. It focuses on the outstanding sports car developments over the last 70 years and on the people behind the brand. Without the legendary pioneering spirit of Porsche’s employees and the enthusiasm of the Porsche community across the world, such a success story would be unthinkable for the sports car manufacturer. “The message of our exhibition is this: The spirit of innovation, which over 70 years has made Porsche into one of the world’s most profitable automotive manufacturer, will continue to drive a unique brand experience into the future,” says Achim Stejskal, Director of the Porsche Museum. Prominent guests at the opening were the two-time World Rally Champion Walter Röhrl, and Richy Müller, the actor known for his role as a police inspector in the German crime drama “Tatort”. The exhibition’s narrative covers the milestones that have shaped the development of Porsche sports cars since 1948, and also looks at ideas for the future. When they first enter the exhibition, visitors are greeted by a Porsche 356 “No.1” Roadster Show Car representing the “Origin of the sports car”. Next in line is the topic “Sports cars of the future” featuring the Mission E, the series version of which will be launched on the market in 2019 as the first purely electrically powered Porsche. Aspects relating to the 911 are centered around the one-millionth unit of this iconic sports car to be produced: An Irish Green Coupé that rolled off the production line in Zuffenhausen in May 2017. The “Sports cars, reinvented” section showcases examples of Porsche engineering through numerous pioneering achievements. This includes bold entrepreneurial decisions, as demonstrated with the Porsche Boxster: This mid-engine sports car successfully brought Porsche AG, which had been struggling financially, back into the black. Porsche on display in Berlin. The 356 “Nr. 1” Show Car in front of the “Brandenburger Tor”. After “The diversity of the sports car” section, which presents Porsche model lines and their contemporary advertisements, visitors move into the “Motor sport” section featuring the legendary 917/20 racing car. The original paintwork on this 600-hp racing car earned it the nickname the “Pink Pig” and, in terms of driving technology and innovation, this car is number one at Porsche. The range of “Sports cars today” is illustrated with a Panamera Turbo S E-Hybrid Sport Turismo, which, as the flagship of the model line, demonstrates the possibilities of alternative drive technology in a virtual reality scene. “Sports cars across the world” shows how customers and followers around the world characterize and celebrate the brand. Finally, “70 years of passion” is dedicated to the employees who have made Porsche so great. Videos, books and interactive dialogue options round off the exhibition concept in all areas. The sports car manufacturer is celebrating this anniversary with numerous activities around the world throughout 2018. On June 9, the Porsche Museum will be open-ing an extensive special exhibition at its Stuttgart-Zuffenhausen site to mark the anniversary. On the same day, Porsche will be inviting fans to its “Sports Car Together Day” at all of its sites around the world. For the weekend of June 16–17, the sports car manufacturer will host employees, residents of the Zuffenhausen district and prospective customers at a public celebration in and around the Porsche Museum in Stuttgart. The “Festival of Speed”, held from July 12–15, at the Goodwood race track in the UK, will also celebrate the anniversary, as will the “Rennsport Reunion” in California from September 27–30. The celebrations will conclude with the “Sound Night” event to be held for the first time in the Porsche Arena in Stuttgart on October 13.